The easiest way is to sell or give it for free to the prospective tenant. However, it may not always be that much of a shortcut. In most cases, you need to look for the prospective tenant who will certainly buy or accept your furniture, as landlords/agencies typically require you to leave the room in a clean and empty state. They most likely won’t do the work for you (i.e. searching for a prospective tenant who’ll take over your stuff) even if you give it for free. You can promote your room including a statement that you need someone who’ll take over the furniture as well (See the Facebook links in the next paragraph). For Sale in Leiden, Leiden Housing, Leiden Swap Shop, Rooms/Housing & Furniture Leiden University, Leiden – BUY / SALE / EXCHANGE, Leiden for Free. You may consider Dutch online platforms such as Marktplaats – one of, if not, the largest secondhand stuff online platform in the Netherlands. Selling them around February or September is likely to give you higher chance of getting rid of them fast. Around these new academic months, there are lots of new comers looking for furniture. If the buyer doesn’t have a car and has to carry big furniture, tell him/her bakfiets are available in most thrift shops for fair hourly rates. Another option is supermarkets’ trolleys. When I first came to Leiden, I met new comers carrying their stuff with a trolley which apparently can be borrowed from your nearest supermarkets e.g. Albert Heijn, Hoogvliet, etc. 4. Ask for your friends’ help. 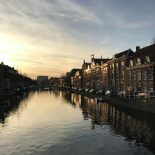 This entry was posted on June 14, 2018 by Nadya Naulita in Housing, Living in Holland, Nadya, Practical Stuff, Student City, Uncategorized and tagged moving, study abroad, study in holland.